The Tibetan people (Tibetan: བོད་པ་, Wylie: bod pa, THL: bö pa) are an ethnic group native to Tibet. Their current population is estimated to be around 6 million. In addition to living in Tibet, significant numbers of Tibetans live in other parts of China, as well as India, Nepal and Bhutan. Tibetans speak Tibetic languages, many varieties of which are mutually unintelligible, which belongs to the Tibeto-Burman language group. The traditional, or mythological, explanation of the Tibetan people's origin is that they are the descendants of the human Pha Trelgen Changchup Sempa and rock ogress Ma Drag Sinmo. It is thought that most of the Tibeto-Burman speakers in Southwest China, including Tibetans, are direct descendants from the ancient Qiang people. Most Tibetans practice Tibetan Buddhism, although some observe the indigenous Bon religion and there is a small Muslim minority. Tibetan Buddhism influences Tibetan art, drama and architecture, while the harsh geography of Tibet has produced an adaptive culture of Tibetan medicine and cuisine. As of the 2014 Census, there are about 6 million Tibetans living in the Tibet Autonomous Region and the 10 Tibetan Autonomous Prefectures in Gansu, Qinghai and Sichuan, China. The SIL Ethnologue in 2009 documents an additional 189,000 Tibetic speakers living in India, 5,280 in Nepal, and 4,800 in Bhutan. The Central Tibetan Administration's (CTA) Green Book (of the Tibetan Government in Exile) counts 145,150 Tibetans outside Tibet: a little over 100,000 in India; over 16,000 in Nepal; over 1,800 in Bhutan, and over 25,000 in other parts of the world. There are Tibetan communities in the United States, Australia, Brazil, Canada, Costa Rica, France, Mexico, Norway, Mongolia, Switzerland, and the United Kingdom. In the Baltistan region of northern Pakistan, the Balti people are a Muslim ethnicity of Tibetan descent numbering around 300,000. There is some dispute over the current and historical number of Tibetans. The Central Tibetan Administration claims that the 5.4 million number is a decrease from 6.3 million in 1959 while the Chinese government claims that it is an increase from 2.7 million in 1954. However, the question depends on the definition and extent of "Tibet"; the region claimed by the CTA is more expansive and China more diminutive. Also, the Tibetan administration did not take a formal census of its territory in the 1950s; the numbers provided by the administration at the time were "based on informed guesswork". PRC officials attribute growth of the Tibetan population to the improved quality of health and lifestyle of the average Tibetan since the beginning of reforms under the Chinese governance. According to Chinese sources, the death rate of women in childbirth dropped from 5,000 per 100,000 in 1951 to 174.78 per 100,000 in 2010, the infant mortality rate dropped from 430 infant deaths per 1,000 in 1951 to 20.69 per 1,000 by the year of 2010 (infant mortality in China as a whole was officially rated at 14 per 1,000 in 2010). The average life expectancy for Tibetans rose from 35.5 years in 1951 to over 67 years by the end of 2010. The Tibetic languages (Tibetan: བོད་སྐད།) are a cluster of mutually unintelligible Sino-Tibetan languages spoken by approximately 8 million people, primarily Tibetan, living across a wide area of eastern Central Asia bordering the Indian subcontinent, including the Tibetan Plateau and Baltistan, Ladakh, Nepal, Sikkim, and Bhutan the northern Indian subcontinent. Classical Tibetan is a major regional literary language, particularly for its use in Buddhist literature. Although some of the Qiang peoples of Kham are classified by China as ethnic Tibetans, the Qiangic languages are not Tibetic, but rather form their own branch of the Sino-Tibetan language family. Tibetans are phenotypically diverse, and exhibit high-altitude adaptations. The genetic basis of Tibetan adaptations have been attributed to a mutation in the EPAS1 gene, and has become prevalent in the past 3,000 years. Recent research into the ability of Tibetans' metabolism to function normally in the oxygen-deficient atmosphere above 4,400 metres (14,400 ft) shows that, although Tibetans living at high altitudes have no more oxygen in their blood than other people, they have ten times more nitric oxide and double the forearm blood flow of low-altitude dwellers. Tibetans inherited this adaptation thanks to their Denisovan admixture. Nitric oxide causes dilation of blood vessels allowing blood to flow more freely to the extremities and aids the release of oxygen to tissues. Modern Tibetan populations are genetically most similar to other modern East Asian populations. They also show more genetic affinity for modern Central Asian than modern Siberian populations. Within Tibetan mythology, the origins of Tibetans are said to be rooted in the marriage of the monkey Pha Trelgen Changchup Sempa and rock ogress Ma Drag Sinmo. Most Tibetans generally observe Tibetan Buddhism or a collection of native traditions known as Bön (also absorbed into mainstream Tibetan Buddhism). There is a minority Tibetan Muslim population. There is also a small Tibetan Christian population in the eastern Tibet and northwestern Yunnan of China. Also there are some Tibetan Hindus who mainly live in China, India and Nepal. According to legend, the 28th king of Tibet, Thothori Nyantsen, dreamed of a sacred treasure falling from heaven, which contained a Buddhist sutra, mantras, and religious objects. However, because the Tibetan script had not been invented, the text could not be translated in writing and no one initially knew what was written in it. Buddhism did not take root in Tibet until the reign of Songtsän Gampo, who married two Buddhist princesses, Bhrikuti of Nepal and Wencheng of China. It then gained popularity when Padmasambhāva visited Tibet at the invitation of the 38th Tibetan king, Trisong Deutson. Today, one can see Tibetans placing Mani stones prominently in public places. Tibetan lamas, both Buddhist and Bön, play a major role in the lives of the Tibetan people, conducting religious ceremonies and taking care of the monasteries. Pilgrims plant prayer flags over sacred grounds as a symbol of good luck. The prayer wheel is a means of simulating the chant of a mantra by physically revolving the object several times in a clockwise direction. It is widely seen among Tibetan people. In order not to desecrate religious artifacts such as Stupas, mani stones, and Gompas, Tibetan Buddhists walk around them in a clockwise direction, although the reverse direction is true for Bön. Tibetan Buddhists chant the prayer "Om mani padme hum", while the practitioners of Bön chant "Om matri muye sale du". Tibet is rich in culture. Tibetan festivals such as Losar, Shoton, Linka, and the Bathing Festival are deeply rooted in indigenous religion and also contain foreign influences. Each person takes part in the Bathing Festival three times: at birth, at marriage, and at death. Tibetan art is deeply religious in nature, from the exquisitely detailed statues found in Gonpas to wooden carvings and the intricate designs of the Thangka paintings. Tibetan art can be found in almost every object and every aspect of daily life. Thangka paintings, a syncretism of Indian scroll-painting with Nepalese and Kashmiri painting, appeared in Tibet around the 8th century. Rectangular and painted on cotton or linen, they usually depict traditional motifs including religious, astrological, and theological subjects, and sometimes a mandala. To ensure that the image will not fade, organic and mineral pigments are added, and the painting is framed in colorful silk brocades. Tibetan folk opera, known as lhamo, is a combination of dances, chants and songs. The repertoire is drawn from Buddhist stories and Tibetan history. Tibetan opera was founded in the fourteenth century by Thang Tong Gyalpo, a lama and a bridge-builder. Gyalpo and seven girls he recruited organized the first performance to raise funds for building bridges to facilitate transportation in Tibet. The tradition continued uninterrupted for nearly seven hundred years, and performances are held on various festive occasions such as the Lingka and Shoton festival. The performance is usually a drama, held on a barren stage that combines dances, chants, and songs. Colorful masks are sometimes worn to identify a character, with red symbolizing a king and yellow indicating deities and lamas. The performance starts with a stage purification and blessings. A narrator then sings a summary of the story, and the performance begins. Another ritual blessing is conducted at the end of the play. There are also many historical myths/epics written by high lamas about the reincarnation of a "chosen one" who will do great things. The most unusual feature of Tibetan architecture is that many of the houses and monasteries are built on elevated, sunny sites facing the south. They are commonly made of a mixture of rocks, wood, cement and earth. Little fuel is available for heating or lighting, so flat roofs are built to conserve heat, and multiple windows are constructed to let in sunlight. Walls are usually sloped inwards at 10 degrees as a precaution against frequent earthquakes in the mountainous area. Tibetan homes and buildings are white-washed on the outside, and beautifully decorated inside. Standing at 117 metres (384 ft) in height and 360 metres (1,180 ft) in width, the Potala Palace is considered the most important example of Tibetan architecture. Formerly the residence of the Dalai Lama, it contains over a thousand rooms within thirteen stories and houses portraits of the past Dalai Lamas and statues of the Buddha. It is divided between the outer White Palace, which serves as the administrative quarters, and the inner Red Quarters, which houses the assembly hall of the Lamas, chapels, 10,000 shrines, and a vast library of Buddhist scriptures. Traditional Tibetan medicine utilizes up to two thousand types of plants, forty animal species, and fifty minerals. One of the key figures in its development was the renowned 8th century physician Yuthog Yontan Gonpo, who produced the Four Medical Tantras integrating material from the medical traditions of Persia, India and China. The tantras contained a total of 156 chapters in the form of Thangkas, which tell about the archaic Tibetan medicine and the essences of medicines in other places. Yutok Yonten Gonpo's descendant, Yuthok Sarma Yonten Gonpo, further consolidated the tradition by adding eighteen medical works. One of his books[specify] includes paintings depicting the resetting of a broken bone. In addition, he compiled a set of anatomical pictures of internal organs. The Cuisine of Tibet reflects the rich heritage of the country and people's adaptation to high altitude and religious culinary restrictions. The most important crop is barley. Dough made from barley flour, called tsampa, is the staple food of Tibet. This is either rolled into noodles or made into steamed dumplings called momos. Meat dishes are likely to be yak, goat, or mutton, often dried, or cooked into a spicy stew with potatoes. Mustard seed is cultivated in Tibet, and therefore features heavily in its cuisine. Yak yogurt, butter and cheese are frequently eaten, and well-prepared yogurt is considered something of a prestige item. Many Tibetans wear their hair long, although in recent times due to Chinese influence, most men do crop their hair short. The women braid their hair into multiple tiny braids called "Rhe-Ba", or just simply put their hair up in a braid or pony-tail in more rural areas. In more urban areas, women wear many different kinds of hairstyles such as pony-tails, braids, buns or just leaving it down. Some men and women wear long thick dresses (chuba) in more traditional and rural regions. The men wear a shorter version with pants underneath. The style of the clothing varies between regions. Nomads often wear thick sheepskin versions. In more urban places like Lhasa, men and women dress in modern clothing, and many choose to wear chuba during festivals and holidays like Losar. Tibet has national literature that has both religious, semi-spiritual and secular elements. While the religious texts are well-known, Tibet is also home to the semi-spiritual Gesar Epic, which is the longest epic in the world and is popular throughout Mongolia and Central Asia. 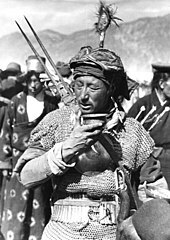 There are secular texts such as The Dispute Between Tea and Chang (Tibetan beer) and Khache Phalu's Advice. Polyandry is practiced in parts of Tibet. This is usually done to avoid division of property and provide financial security. However, monogamy is more common throughout Tibet. Marriages are sometimes arranged by the parents if the son or daughter has not picked their own partner by a certain age. ^ "The Dalai Lama has given his opinion on the refugee crisis and it's extremely controversial". Independent.co.uk. 1 June 2016. Archived from the original on 13 December 2017. Retrieved 14 December 2017. ^ Refugees, United Nations High Commissioner for. "Refworld - Nepal: Information on Tibetans in Nepal". Refworld.org. Archived from the original on 20 October 2013. Retrieved 15 August 2013. ^ a b "Tibetan - Becoming Minnesotan". Education.mnhs.org. Archived from the original on 20 August 2013. Retrieved 15 August 2013. ^ "Tibetan Immigrants in the United States: Extended Version". tenzinyeshi.com. Archived from the original on 24 October 2018. Retrieved 4 January 2019. ^ "Census Profile, 2016 Census Archived 22 April 2018 at the Wayback Machine". Canada 2016 Census. 2016. ^ "Tibetan in Pakistan". Joshuaproject.net. 4 February 2017. Archived from the original on 13 December 2017. Retrieved 9 May 2017. ^ "Australian Tibetans Vote In Landmark Election For Tibet's New Leader". Atc.org.au. Archived from the original on 12 April 2013. Retrieved 14 February 2013. ^ a b Ghoso, Seonaigh MacPherson, Anne-Sophie Bentz, Dawa Bhuti (2 September 2008). "Global Nomads: The Emergence of the Tibetan Diaspora (Part I)". migrationpolicy.org. Archived from the original on 21 September 2018. Retrieved 4 January 2019. ^ Origins and Migrations in the Extended Eastern Himalayas. BRILL, 2012, page 309. ^ "CHINA STATISTICAL YEARBOOK" (PDF). Stats.gov.cn. 2003. Archived (PDF) from the original on 7 March 2011. Retrieved 17 August 2018. ^ "US senators approve 5,000 visas for Tibet refugees Archived 27 December 2013 at the Wayback Machine". The Straits Times. May 21, 2013. ^ Anna Akasoy; Charles S. F. Burnett; Ronit Yoeli-Tlalim (2011). Islam and Tibet: Interactions Along the Musk Routes. Ashgate Publishing, Ltd. pp. 358–. ISBN 978-0-7546-6956-2. ^ "Population transfer and control". Wikiwix.com. Archived from the original on 22 August 2009. Retrieved 21 June 2012. ^ "1950—1990 年" (in Chinese). Archived from the original on 24 November 2007. ^ Fischer, Andrew M. (2008). "Has there been a decrease in the number of Tibetans since the peaceful liberation of Tibet in 1951?" In: Authenticating Tibet: Answers to China's 100 Questions, pp. 134, 136. Edited: Anne-Marie Blondeau and Katia Buffetrille. University of California Press. ISBN 978-0-520-24464-1 (cloth); 978-0-520-24928-8 (pbk). ^ "Mortality rate, infant (per 1,000 live births)". World Bank. Archived from the original on 13 July 2010. ^ "Life expectancy in Tibet nearly doubled over last six decades: white paper". Xinhua. 11 July 2011. Archived from the original on 15 November 2013. ^ "Special Blood allows Tibetans to live the high life." New Scientist. 3 November 2007, p. 19. ^ "Elevated nitric oxide in blood is key to high altitude function for Tibetans". Eurekalert.org. Archived from the original on 3 November 2007. ^ "Tibetans Get Their Blood Flowing". Sciencenow.sciencemag.org. 30 October 2014. Archived from the original on 31 October 2007. ^ Hoit, Brian D.; Dalton, Nancy D.; Erzurum, Serpil C.; Laskowski, Daniel; Strohl, Kingman P.; Beall, Cynthia M. (2005). "Nitric oxide and cardiopulmonary hemodynamics in Tibetan highlanders". Journal of Applied Physiology. 99 (5): 1796–1801. doi:10.1152/japplphysiol.00205.2005. PMID 16024527. Archived from the original on 26 October 2007. ^ "Tibetans inherited high-altitude gene from ancient human". Sciencemag.org. 2 July 2014. Archived from the original on 17 August 2018. Retrieved 17 August 2018. ^ a b Lu, Dongsheng; et al. (1 September 2016). "Ancestral Origins and Genetic History of Tibetan Highlanders". The American Journal of Human Genetics. 99. ^ Stein, R.A. (1972). Tibetan Civilization. J.E. Stapleton Driver (trans.). Stanford University Press. pp. 28, 46. ^ "卡力岗现象及其分析—— 中文伊斯兰学术城". Islambook.net. Archived from the original on 12 March 2012. Retrieved 21 June 2012. ^ "Shoton Festival – The Yogurt Celebration of Tibet". Explore Tibet. 16 August 2018. Retrieved 20 February 2019. ^ Stein (1978), pp. 97-98. Chisholm, Hugh, ed. (1911). "Tibet" . Encyclopædia Britannica. 26 (11th ed.). Cambridge University Press. p. 918. Goldstein, Melvyn C., "Study of the Family structure in Tibet", Natural History, March 1987: 109–112. ( on the Internet Archive). Stein, R.A. (1972). Tibetan Civilization. J.E. Stapleton Driver (trans.). Stanford University Press. ISBN 0-8047-0901-7 (paper); ISBN 0-8047-0806-1. Su, Bing, et al. "Y chromosome haplotypes reveal prehistorical migrations to the Himalayas". Human Genetics 107, 2000: 582–590.